The 5-in-1 combo style bounce house is the ultimate in inflatable jumpers! The large interior jumping area offers a basketball hoop and both log and pop-up obstacles. This bouncy castle has a climb feature and a convenient exit slide for hours of active fun! Parents and spectators are offered a clear view with the 360-degree mesh sides of this moonwalk. The 5-in-1 combo bounce house is made of lite n strong fire-resistant vinyl for safety and durability . This 5-in-1 bouncy house is sure to make any indoor or outdoor event a great success! 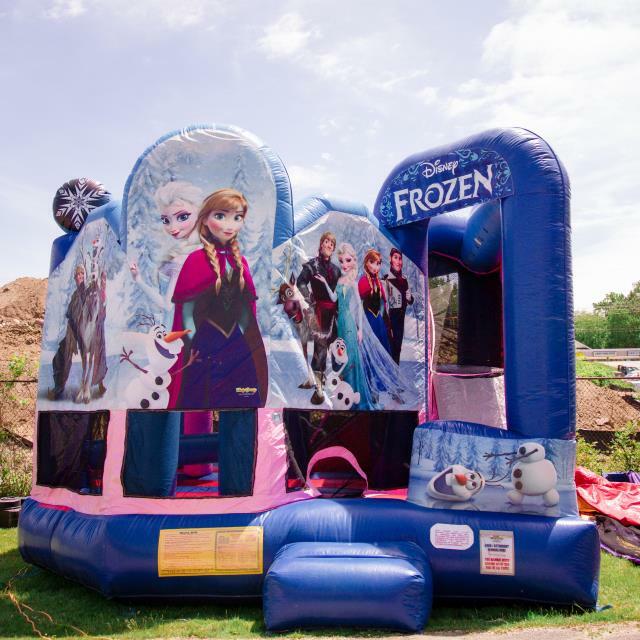 * Please call us for any questions on our game inflatable frozen rentals in Cleveland, Chardon OH, Mentor OH, Chagrin Falls OH, Ashtabula Ohio and surrounding communities.